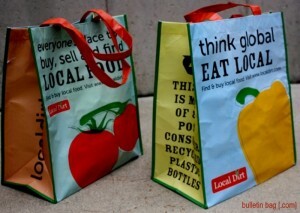 Laminated Whole Foods Bags: Yes, We Can! “You know those laminated Whole Foods bags? Do you make those?” We have a lot of conversations that start out this way. (Psst…the answer is yes!). Bulletin Bag currently offers custom laminated bags in 13 stock sizes, and with several material options (some are even insulated). Additionally, we can make any of our custom bags in ANY shape, size, or material! Remember that the lead-time is much longer for these bags than for our stock bags. What’s the difference? Stock bags have an imprint area that your art needs to print within, while custom laminated bags print from seam to seam on all surfaces of the bag. The minimum order quantity is 2500 bags for custom laminated bags, but the end result is worth it for a lot of clients. After all, it’s your messaging in full color, on all surfaces of the bag! We know we say this all the time, but it really is important to know that if a company tells you they can produce a laminated custom bag in less than 90 days, proceed with caution! This is a red flag that indicates inexperience with the process—or a sign of someone who will make time commitments they may not be able to fulfill. Because the process for creating laminated Whole Foods bags is so complex, it’s critical to choose a company (like us!) that has experience in producing them. We have the knowledge and expertise to attend to every detail, and will work as your partner to make your bag concept a reality. Ready to learn more? You can read our FAQ on designing custom laminated bags. There’s even a little video! You can check out a very small sampling of our projects in our client gallery. Or, you can contact us to get pricing and more information!